Sleepy Hollow has enjoyed a popular first season and plenty of viral traction during its short lifespan. With the Season 2 premiere hitting the schedule on September 22 and the Season 1 Blu-ray and DVD release headed into homes in just a couple of weeks, it would make sense that Twentieth Century Fox Home Entertainment might want to market the set with some fun ecards for fans. 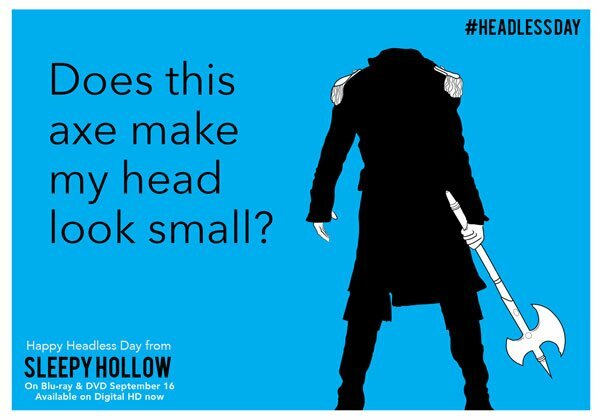 Unfortunately, the company chose a “Sleepy Hollow Headless Day” to promote the set just a short while after news broke that American Journalist Steven Sotloff was beheaded and a few weeks after photojournalist James Foley suffered the same devastating fate. The Sleepy Hollow team released the ecard event this afternoon, which was just after news broke about Sotloff’s death. While beheadings have been a big part of the media coverage over the past several weeks, it does take some time to roll out a big marketing promotion. Still, the timing probably couldn't have been worse. An hour later, the apologies started rolling out from the PR team to their "sleepyhead" fans and anyone else who might have encountered the cards. 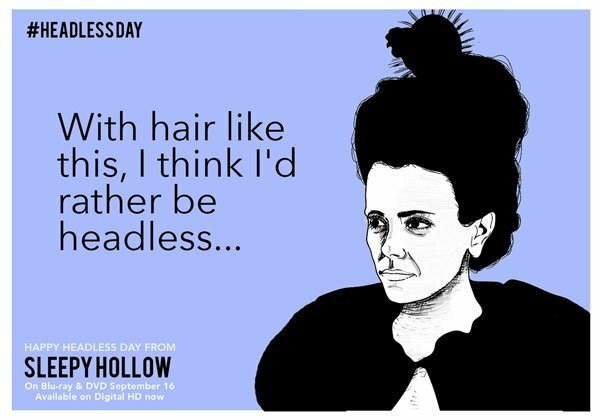 Here’s the quote from Sleepy Hollow’s home entertainment PR team. 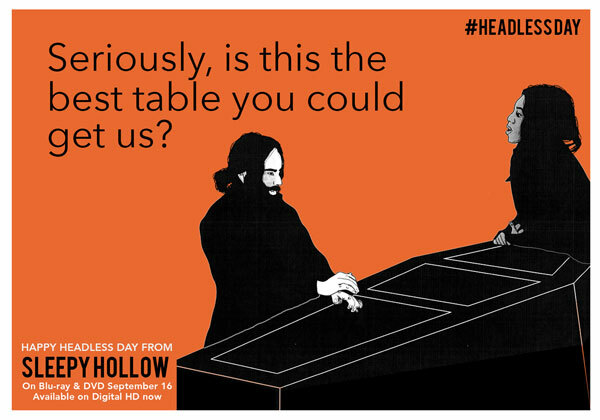 The ecard idea was actually a pretty cute one, featuring the Sleepy Hollow characters cracking bad headless jokes. On almost any other day, these would have been shared with as many puns as possible in the article, but today is just not that day. It might seem like a big snafu for the PR team to have totally missed a big social issue going on in the world around them—especially one related to United States citizens. However, these things happen from time to time. I once wrote an article describing how Whitney Houston was in talks for The X Factor that went up as news was breaking that the singer had died at the age of 47. 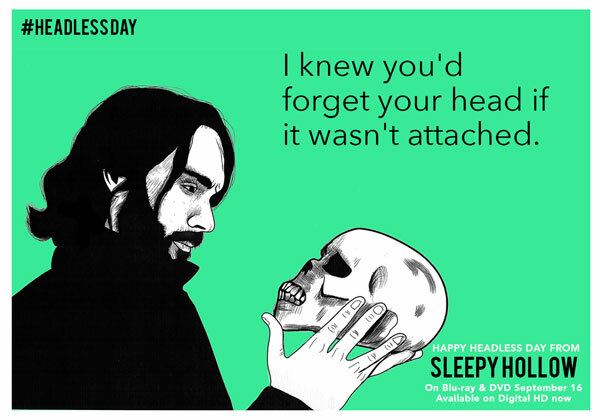 The Internet had a heyday with that one, just as they are having a heyday with the Sleepy Hollow crew. As humans, we love to point a finger at other people's mistakes. But let's just keep our minds on the tragedy of U.S. journalists getting killed by ISIS militants and remind ourselves that Sleepy Hollow is supernatural, fictional drama that's meant as light entertainment only. No one was trying to cause any disrespect, and when it became clear the posters weren't going over well, the appropriate statement was released immediately. You can flip over to the next page to see what else the PR team initially had in store or you can head here to catch up on the terrifying situation in Iraq.